An elderly man was in critical condition last night after a fire tore through his Borough Park apartment, fire officials said. It wasn’t clear what sparked the flames that left the unidentified man struggling to survive at Maimonides Medical Center with second-degree burns on his upper body and in his airways. The blaze began at around 8:25 p.m. yesterday, in a fifth-floor apartment of the six-story building at 4800 14th Ave. 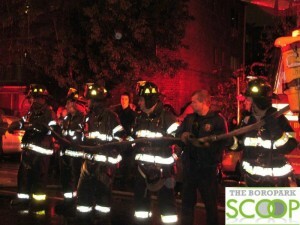 Numerous Hatzolah members were dispatched to the scene, including Paramedics, and at least three ambulances. Officials were still investigating the cause of the blaze. Oy. Please post his Tehillim name. May Hashem give him a refuah shelaima bekarov!